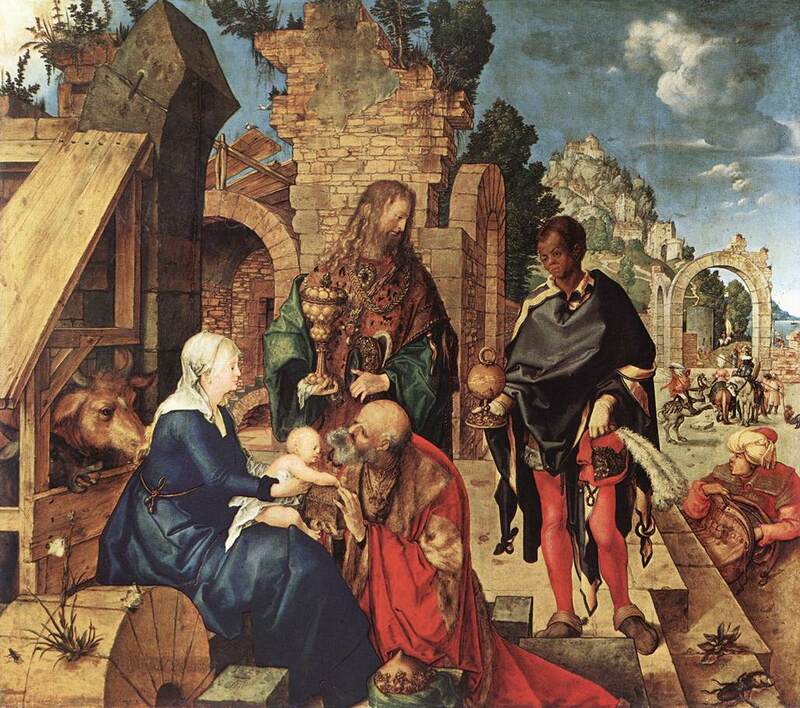 Durer's Visitation of the Maji. A little dramatic fable based on the legend that on Christmas eve the animals can talk! Intro: Show all the animals — cows, sheep, donkeys, camels, stable mice, barn swallows — together in stable setting. Sound of clock chimes (vocal). Midnight. Just a few hours now until Christmas morning. Have you found your voices, everyone? Cow: Donkey, are you ready to start? Well, it was a donkey that started things off so many years ago. He was an very ordinary little grey donkey. His saddlebags were light. His job was to carry the lady and the baby that was still in her tummy. But she was so lovely and kind that his load never felt heavy. The road was long and dusty. They plodded a long way. Just the donkey and the lady and man and the baby who travelled with them. But the story goes that my cousin never got tired. He never slowed his steady pace. He just enjoyed the trip. He felt so special making a trip with such nice people. The lady often stroked his neck and spoke kindly into his long grey ears. He knew she was very tired and he was worried about her. When they finished their trip and reached the tiny town of Bethlehem, they still had to knock on many doors. The little town was so busy — it was buzzing with people. For the lady and her husband, the answer was the same everywhere — No Room. This is where you come in, isn’t it, Cow? Yes, well, one innkeeper took pity on the tired couple. And imagine, our lady so big and uncomfortable still carrying that baby around in her tummy. Although there were no beds left, the innkeeper said they could rest in the sweet hay of his stable. It was almost quieter there than in the noisy bustling rooms of the inn. That night, in the privacy of the stable, the baby was born. His mom wrapped him up snuggly in blankets. The tired but happy mother and father told the cows and stable mice and barn swallows that the baby’s name was Jesus. One of my cousins nudged a manger with her snout. The lady smiled, fluffed up the hay inside and laid the baby down in it. It was quite a night. It was hard for everyone to settle down, the story goes, because of the strange and different bright star that lit up the night sky. Yet they say it was uncommonly peaceful. That is until all the visitors began to arrive. This is our part — about the sheep and the shepherds, right? Cow: Yes, it is. Would you like to tell us about it? Certainly. We were quite surprised to be there that night. There we were — out in the pasture that night — minding our own business. Then low and behold, an angel appeared out of nowhere — and scared the daylights out of us. “Don’t be afraid,” said the angel. “I have good news, which will bring great joy to all people. “Today in the town of David a saviour was born — he is Christ the Lord. Ahhhh [sigh]. That gave us something to talk about for some time. And it did get pretty crowded around here when those three fancy kings from the east showed up. That was quite a trip, huh, Camel? Yes, it did take a few unexpected turns. The wise ones had been watching for a mysterious star. They finally saw it from their palaces in the east. They began preparing for a long journey — with food and supplies, camels, cooks and animals handlers. Then they began the long trip west. They finally arrived at this little backwater town and starting asking around. But no one seemed to know anything. Not a thing about the star or the baby boy who would be the future king. Even the king of the day, some guy named Herod hadn’t heard anything. (My cousins had a bad feeling about him right away.) So the whole caravan made a side trip to speak to the king. He asked if they would let him know when he found the baby because, uh, he’d like to worship too — yeah, that’s it. So they kept on following the star. It led right up to the place where the baby was resting with his mom and dad. And oh, what a sight — so many creatures — but it was so peaceful. The wise ones had costly gifts—treasure chests of gold and fancy perfume bottles of sweet-smelling frankincence and myrrh. But their gifts seemed almost cheap in the middle of that peaceful feeling. But give they did — and with joyful hearts. Cow: Don’t you all agree that would be the most special thing about that night — that peaceful feeling? Cow: And every Christmas morning when we have found our voices and remember the stories of seeing that special baby, this is the idea we like to share — Ready everyone? Peace on earth and good will to all people! Writer's note: I wrote this play for my own children about 8 years ago. So it's a bit earnest and straightforward, geared toward younger but very verbal children with dramatic flair! I believe we did it with the dreaded popsicle stick puppets against a big boxboard backdrop. The kids did remember a lot of detail of the nativity story thru it. So why not share. Merry Christmas!